Rinkai Nissan Construction Co., Ltd.
Tokyo, Japan �EJuly 17, 2018 �EThe joint venture of Penta-Ocean Construction Co., Ltd. (President: Takuzo Shimizu); TOA Corporation (President: Masaki Akiyama); Rinkai Nissan Construction Co., Ltd. (President: Takehiko Yamaguchi); PT PP(Persero) Tbk. ; and PT Wijaya Karya (Persero) Tbk. has been awarded the contract for construction of Patimban Port Development Project (1) Package 1: Terminal Construction by the Directorate General of Sea Transportation of the Ministry of Transportation of the Government of Republic of Indonesia with a contract value of approximately JPY 50 Billion for the joint venture. The construction period of the project is 25 months. The project is funded under the ODA loan scheme of Japan International Cooperation Agency (JICA). 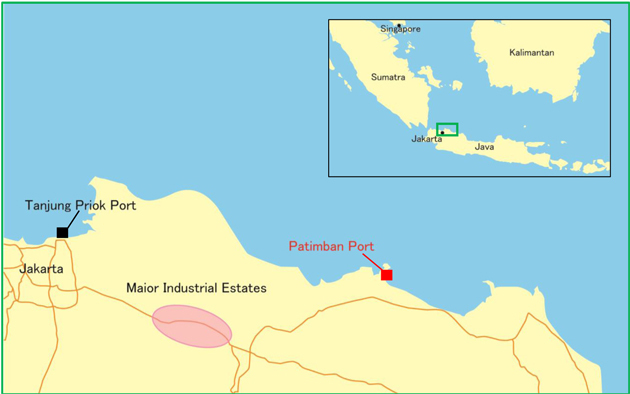 The joint venture will construct a new port at Patimban area where located in the eastern part of Jakarta metropolitan area and develop as the largest international trade base of Indonesia aligned with Tanjung Priok Port, the current largest port in the country. In Jakarta metropolitan area, which has a large number of Japanese manufacturing firms, the traffic congestion on the access road to Tanjung Priok port has been a major issue due to increasing volume of cargo transportation. Therefore, the construction of new Patimban Port is expected to diversify cargo transportation that concentrating in Tanjung Priok port and will help improve logistical efficiency in the area. ODA loan scheme for the project this time includes the Special Terms for Economic Partnerships (STEP) aiming toward technology transfer to the developing countries by best use of Japan’s superior technologies and know-how in the field. This project will be scheduled to utilize the advanced technologies of Japan in the reclamation work, soil improvement work, pier construction, etc. providing shorter work schedule through time-saving and rapid construction methods. Penta-Ocean Construction, TOA Corporation, and Rinkai Nissan Construction have worked continuously in numerous projects in Indonesia such as ODA financed projects; petrochemical and LNG-related facilities including factory buildings of the Japanese manufacturers. Each company will continue to contribute to the further development of the country by making full use of the abundant experience and technical strength cultivated both in Japan and overseas. CDM (Cement Deep Mixing Method) Qty:Approx. 41,000 nos.